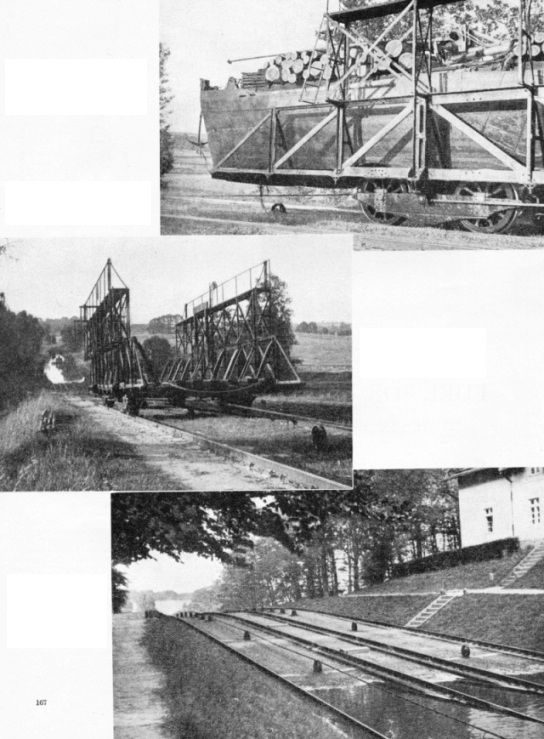 Instead of using navigational locks, barges on the unique Overland Canal, in East Prussia, are hauled between different levels on wagons running on sets of rails. ROPE WHEELS, driven by a water wheel, carry the 1½-in wire rope which hauls the barges over a stretch of land between different levels of the Overland Canal. The Overland Canal runs between the towns of Elbing and Osterode, in East Prussia. THE BARGE ENTERS the wagon as it would a lock. When the barge is secured to the wagon, the water wheel at the engine house is set in motion and the wagon, complete with barge, is hauled out of the water. ON DRY LAND a barge is an unusual site. The barges used on the Overland Canal are of about 60 tons. They have an overall length of about 80 feet and a beam of about 10 feet. 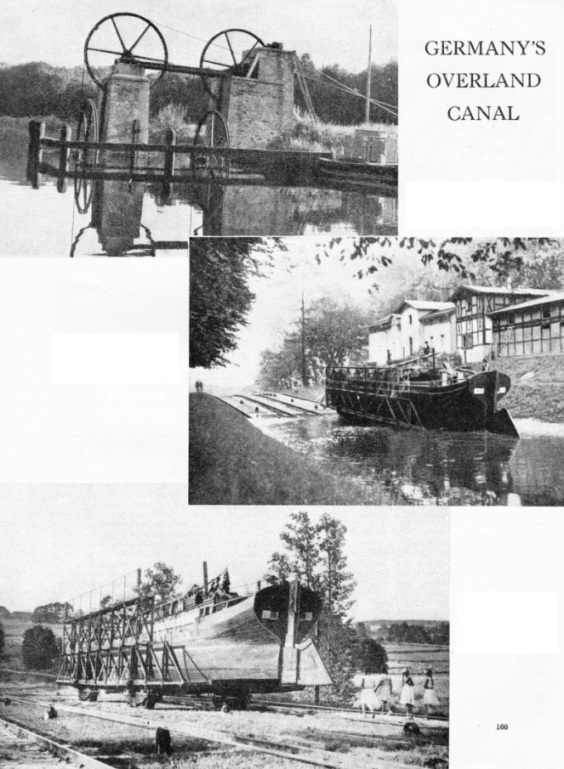 A WAGON running on rails carries the canal barge from one level to another. This means was adopted by Steenke, who built the canal in 1844-61, instead of the usual method of building navigational locks. AN EMPTY WAGON on the Overland Canal resembles a navigation lock on wheels, except that its walls have open framework strong enough to hold the weight of a barge but retaining no water. TWO SETS OF RAILS are used for each of the land sections of the canal. This makes it possible for one barge to be drawn up while another is making the descent, thus economizing on power. The five land sections make a difference of 110 yards in the canal level.